In the 17th century Lübeck was one of the main centres of music in north Germany. Its reputation as such was widespread throughout northern Europe. Highly skilled players of violin and viola da gamba had been working in Lübeck since the beginning of the century. As they were also active as teachers the tradition they established was kept alive. The city's council employed an ensemble of players, collectively known as 'Ratsmusik'. The members of this ensemble were expected to be virtuosos on more than one instrument. An example is Hans Iwe, Buxtehude's assistant organist in the Marienkirche, who played the violin, the viola da gamba and the violone. One of the applicants for the Ratsmusik was the gambist Peter Grecke. His letter of application to the council in 1672 reflects the high standards set: "(...) I am aware that your noble and worthy council never employs common waits, but famous musicians and good composers who have excelled at noble and princely courts". There were ample opportunities to play: not only was the Ratsmusik expected to perform at official occasions, they also performed during the Abendmusiken which Buxtehude's predecessor, Franz Tunder, had established as well as during services. And they also played in private surroundings, like the homes of the city's upper class. The members of the Ratsmusik played music from all over Europe, but also music composed for them in Lübeck itself. 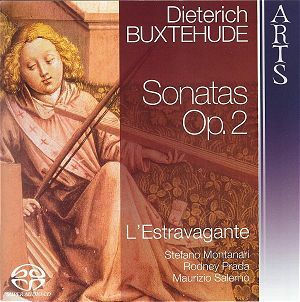 It is very likely that Buxtehude's sonatas were written for them as well. But it is quite possible that he himself also played them, for example together with musicians from Hamburg, as he had close ties with, in particular, Johann Theile and Jan Adam Reincken. Buxtehude's sonatas have a trio texture, but whereas the Italians preferred the combination of two violins and bass, in northern Germany composers opted mostly for a combination of violin, bass viol and basso continuo. Here also a specific style was developed which combined several elements. One of these was the polyphony of the English consort music, which had been brought to northern Germany in particular by William Brade (1560-1630) who had worked in Copenhagen and several German cities before settling in Hamburg. Secondly the instrumental music of this period shows the influence of the so-called 'stylus phantasticus' of the North-German organ school, whose main features are its improvisatory character and contrasts in tempo, 'Affekt' and metre. During the 17th century a third influence was added: the virtuosic style of solo playing from Italy. One can imagine that the collections of music published in Dresden by Carlo Farina, one of the main representatives of this style, had some influence on musicians in Lübeck. In Buxtehude's sonatas all three elements are represented, and he often combines them in an ingenious way. In the Sonata I from Op. 2, for instance, five different metres are used. In the Sonata II from the same collection the second movement is a fugue with the indication 'allegro', which all of a sudden shifts to a 'largo' - exactly what the 'stylus phantasticus' is all about. Strong contrasts can also be found in the Sonata III from Opus 1: a vivace is flanked by a lento and a largo which both contain harsh dissonances. Elsewhere Buxtehude makes a number of excursions to other keys, in particular in the Sonata VII from Op. 2. Instrumental virtuosity can be found in the Sonata V from Op. 2, whose second movement has the indication 'solo'; here the violinist can show his skills. It is one of the places in these sets of sonatas where Buxtehude requires double-stopping. The following movement is described as 'concitato', a clear reference to the Italian style, especially the stile concitato which Monteverdi made use of. Later on in this sonata the viola da gamba also has a solo passage. There is some double-stopping for the viola da gamba as well, in the Sonata VII from Op. 1. Other elements in these fourteen sonatas are variations on a subject and the regular use of a basso ostinato. This description suffices to show how rich these sonatas are. It is no wonder that nowadays they are amongst the more frequently played chamber works. There are several recordings of these sonatas in the catalogue, the best-known of which are probably the performances by John Holloway, Jaap ter Linden and Lars Ulrik Mortensen (originally released on Dacapo, recently reissued by Naxos). But there is certainly a place for these new recordings as they are first-rate. The ensemble was founded in 2007 and these two discs represent their very first recordings. They could hardly have made a better start. The technical skills of the players are impressive, as in particular the solo passages show. They also produce an excellent ensemble sound, and the balance between the three instruments is very satisfying. But what is more important: the expression in these sonatas is fully explored here, and the internal contrasts are well worked out. The choice of tempi is very convincing: they sometimes play at high speed, but it never sounds hasty, thanks to clear articulation. One of the features of these sonatas is the repetition of notes, and these can become tiresome when they are always played the same way. That is not the case here because of the differentiation within those sequences and the use of clear dynamic accents. On the other side of the spectrum: the grave from the Sonata I (Op. 2) is played very slowly, but with great expression. 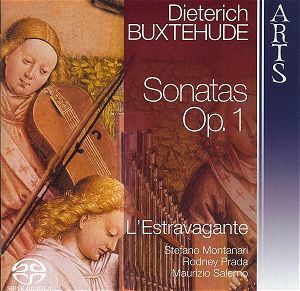 In short: these are very impressive and expressive interpretations of Buxtehude's splendid sonatas. I very much hope the remaining chamber music - a handful of sonatas was never published - is going to be recorded in the near future.